I am so tired of … INSOMNIA! When was the last time I had a good night sleep? I have no trouble falling asleep; my problem is in staying asleep. Maybe, if I am lucky, I can go two hours without waking, but that is usually not the case. No…I am looking for the elusive “all nighter.” You know, the full night sleep without the blasted helicopters waking me up as they search the seas for drug runners, or illegals. Or, where did that “Charley Horse”, or crick in my neck come from? Why, after playing a game of scrabble before going to bed, do the letters I used keep appearing in my mind? Why can’t I fall asleep without thinking of some topic to write about for the OBRag? Why can Buddy, my Golden Retriever, have dreams that allow him to keep sleeping but wake me up by his noises? Where did that damn fly come from that sounds like a kamikaze circling over my head? Why doesn’t the young man dropping off the neighbor girl across the street turn off his motor as they “make out” in the car? Why do the neighbors down the street have to YELL at each other at 2:00 in the morning? Why couldn’t they yell at each other earlier? Want to know something funny? I can take a nap in the middle of the day and NONE of those noises bother me. I can sleep soundly and wake up refreshed – at least for an hour or so until I find I am tired again. I think instead of turning our clocks back 1 hour in a few weeks, we should turn them back 12 hours. If I can’t sleep at night, maybe I can sleep during the day. Written at 2:45am – October 27th. So….what do I do now until the alarm goes off at 6:00am? I sleep better when the computer in my bedroom is shut down. My computer is clear at the other end of the house. I talk myself out of getting up and going to it by saying, “it is cold”; I’ll wake up my students; the dog will want to go out, etc. and I STILL wake up. Last night there were 5 helicopters that went by. If the airport is closed from 11:30-6:30 so that the resident’s sleep is not disturbed, then why do we have to put up with the helicopters? Thanks for your suggestion. I completely sympathize with you. Many people don’t understand insomnia. They think it’s just your body refusing sleep. Which is so not the case. It’s much easier to deal with when your body has the “coffee buzz” feeling. The worse bouts of insomnia come when your body is fatigued and tired but your mind races about things that surely should (and could) wait until the next morning. It’s about your senses catching things it really doesn’t need to be catching. Like your neighbors porch light that isn’t very bright, but still seeping through the break in the curtain. Or the sound of your nocturnal cat grabbing a midnight snack from the dry bowl. Even worse, though, is the “hangover” of the insomniac. 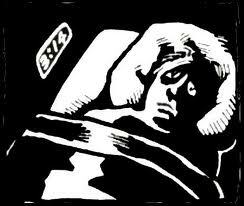 Those who are prone to sleepless nights can attest to this. It’s waking up the next morning after a short nap (loss for a better term) and feeling like you were out all night drinking tequila shots in a loud bar. Your head hurts, your body aches, and even a brisk morning walk for an espresso doesn’t do the trick. It’s all the hell of the hangover without all the fun of what you would do to get one. Judi – hey listen, if it takes you a night without much sleep to come up with your wonderful posts on the OB Rag, well, gee, maybe we should send more mid-night kissers to your neighborhood ha ha ha. Dallas you are so right – I have felt BETTER from a hangover than I sometimes feel when it is time to get up and start the day. And you are correct – it is the little things that keep me awake. So why, then, do Dave and I feel better after a short nap – even with the distractions – than at night when our body is “programmed” for sleep? And, Frank, I think all those other little “kissers” will be dropped off on my corner on Sunday night to trick or treat. The parents keep their motors running so I wonder if I should try to sleep then. I am wondering if I should ask to see their green cards, or immigration papers, or….before I give them a piece of candy! When I can’t sleep at night I usually get up and watch TV or read until I get sleepy or I lay down on the couch with the sound turned low on the TV and usually go right to sleep. My naps are always accompanied by the low TV. You seem to have a lot of energy for someone who gets little sleep. John, I don’t want to be the cause of no sleep for you tonight – after all – one of us not sleeping is enough, I thought I better answer this post haste! The only thing different from your two answers I am not doing is “leaning how well my ‘wife sleeps with her little sounds. '” Not having a wife – but not adverse to having one – and losing my husband a year ago, eliminates those sounds from nightly attempt to sleep. (Although I did tell my husband that he would make someone a wonderful wife!) Could it be I miss his snoring? Doubt it, because Buddy sometimes snores louder than Bob ever did. And Jim, I fall asleep with the TV on. But I also wake up with the TV on. And when I sleep during the day – I don’t have the tv on because I DON’T NEED IT TO SLEEP! Go figure. John, do you think I could “borrow” your wife for a night or two to see if that is my problem. But…it will have to wait two weeks. See…I host foreign language students that are here to learn English. My student that was supposed to leave tomorrow has decided to stay for 6 months. Another student – from Germany/Poland will stay until Nov. 11th and a new student from Kazakhstan arrives tonight. (He sent the school an email saying he would be in around 9:00pm. No airline; I can imagine what his stay – until Feb. 19th – will be like. So…rather than have your wife share my new students bed – which was mine last night but will give up to him till the 11th – I can wait to “borrow” her. Unless, of course, she doesn’t mind sleeping on the other couch in the living room. You may not recognize me, John, but if you are walking down Newport and you see an old lady carrying the bags under her eyes in a recycled bag – chances it is me. Sleep well. One of us has to. Have you tried a white noise generator? I find that really helps block out distractions when I am having trouble sleeping. This is a perfect excuse for gettin’ outa town, & visiting places like ; Joshua Tree, & Big Bear – for a while ! Then its always nice to come back home to OB. Living full time at the beach definitely has its price !! That’s for sure ! Relaxing techniques such as breathing exercises work for me. Thank you for your great suggestions in my quest to find a cure for insomnia! Exercise in general helps sleep, if you can talk the dog into doubling the walk! I use PBS radio, at night they play classical music, and I put it on very low. It has really helped. Thanks. Genie. I will try it. My trouble is when I recognize what they are playing and hum along with it. I’ll let you know. Funny that you wrote that today. I am on my way to my homeopathic masseuse to pick up a new sleep remedy. Maybe it will work tonight. If you notice, I wrote this article in 2010 and I am still not sleeping!!!! !